First, you determine the location for where your vintage travel trailer rental will be parked. 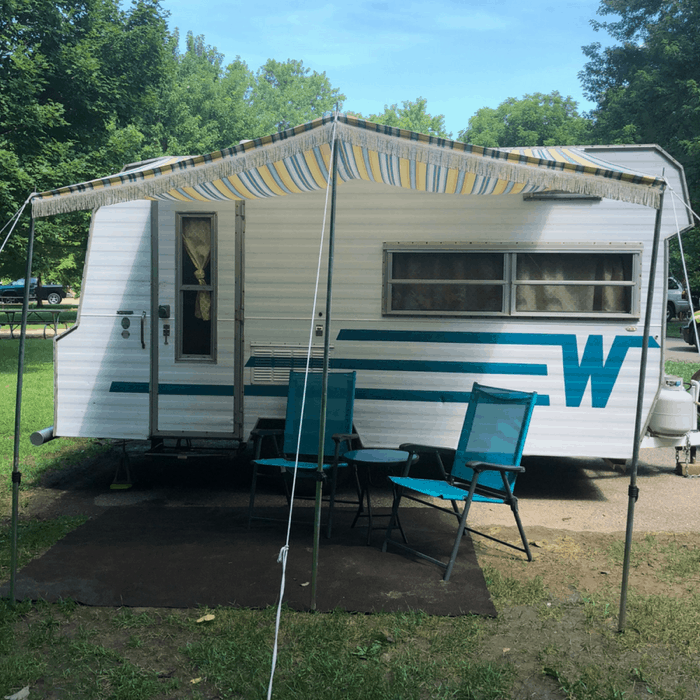 You have the option of picking up the camper or you can have a travel trailer delivered within a 70-mile range from the city of Cincinnati, Ohio with the price determined by the zone. Let’s be honest a BIG part of the stress when you camp can happen before you even arrive by pulling the camper and then having to set up everything at the campsite once you arrive. The beauty of having a camper delivered is that all you have to do is show up. Seriously, this is beautiful! Our vintage camper rental was ready and the canopy was even out. 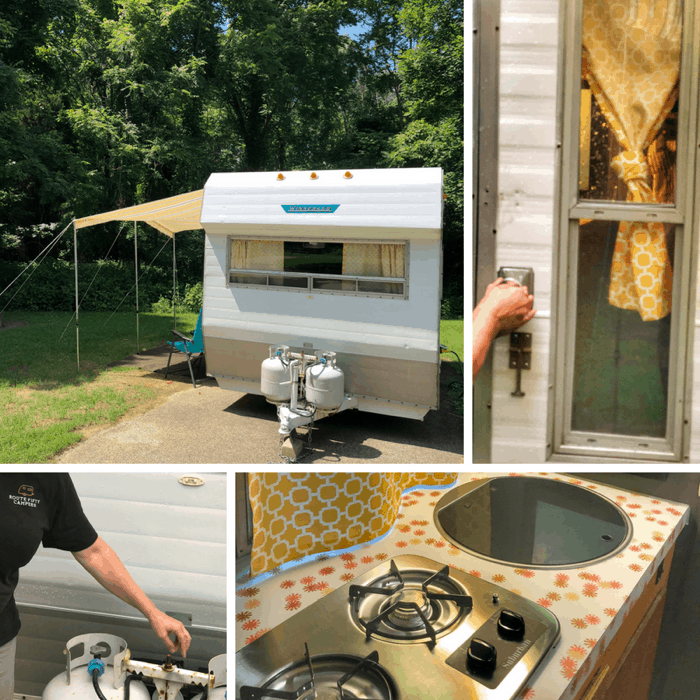 We were given a thorough tour of the camper and its equipment so that we could feel confident in how to use everything during our stay. If you have the proper equipment and decide to pick up the camper yourself, you are also given a detailed walkthrough before you leave. There is no cost if you tow the camper within a 100-mile range but at mile 101 there is a mileage charge. 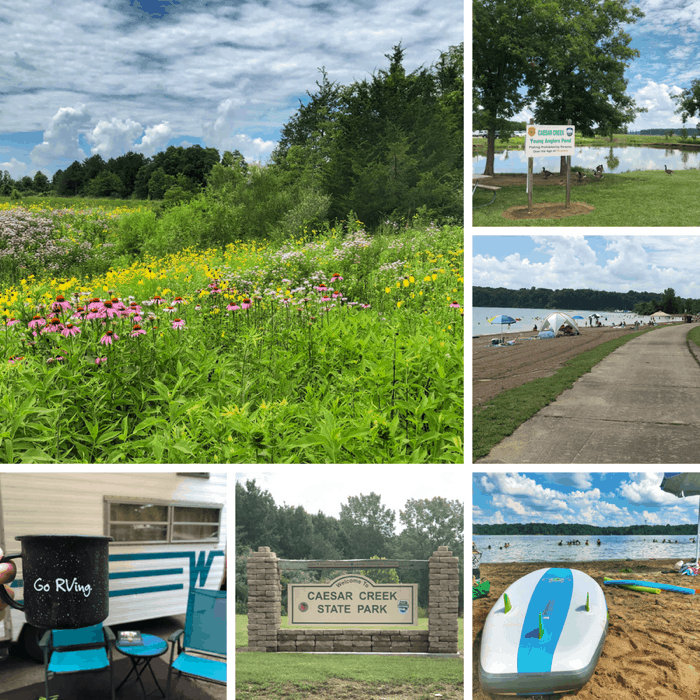 We wanted a campground that had a swimming lake with a beach which can be harder to find in the Cincinnati Metro. 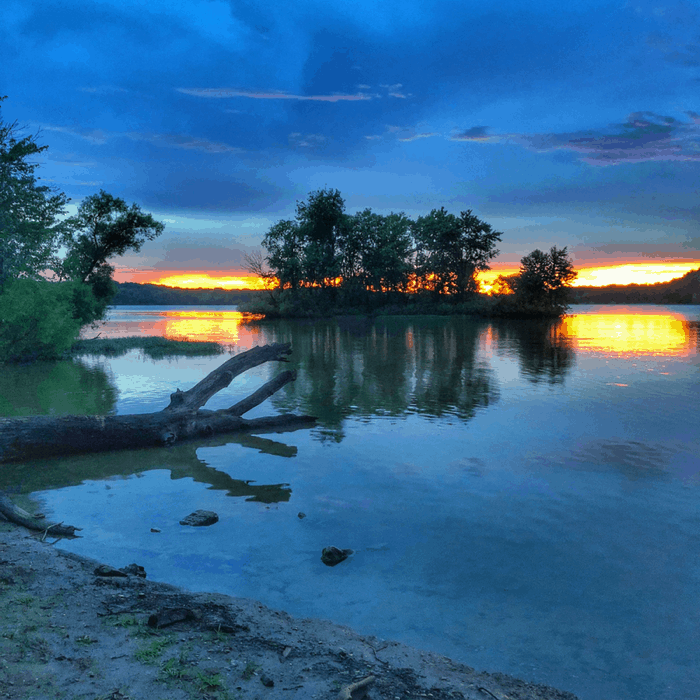 We asked for a few suggestions and decided that Caesar Creek State Park, located about an hour north of downtown Cincinnati, would be our best option for what we were looking for. There were plenty of camping sites that were spread apart far enough so that we didn’t feel like we were camping on top of our neighbor. There were hiking trails but it was really HOT and HUMID (90 degrees+) during our visit which didn’t leave much leftover energy for more than swimming. I definitely want to check out the trails at another time. Our trailer came stocked with dishware, bedding, towels, toaster, tea kettle, coffee press, smoke detector, fire extinguisher, an outdoor carpet, two outdoor chairs and an awning. This made it easy to cook when we wanted to. We also had a sink which came in handy during meals and for washing hands. The small details in decor and design also make all of the difference. 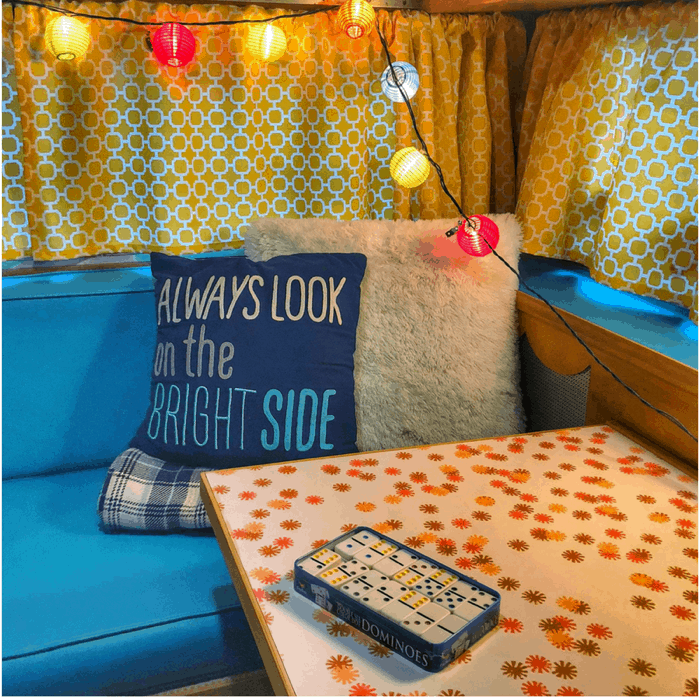 From the personalized greeting to the extra games, fun pillows, string lights and glamping book, I always appreciate when someone goes the extra mile to create an experience or ambiance. Another perk of the 1964 Winnebago rental is that it is tall person friendly. My husband is 6’4 and he could stand up straight without bumping his head …but there was one light fixture that he did have to be mindful of. 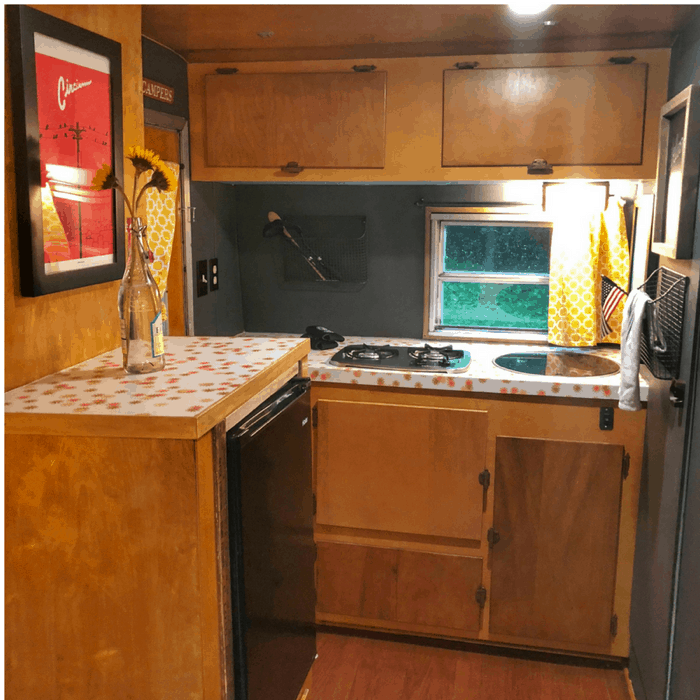 We were happy to discover that there were several modern updates made to the vintage camper that included Air conditioning and a three-prong outlet with USB outlets to charge your phones. Our first night in the RV would have been unbearable without the AC because it was SO HOT, muggy, and raining. The inside was so cute that I didn’t mind staying in and rest assured that each retro rental is equipped with air conditioning. Like I mentioned before, my husband is 6’4 which means that a small sleeping area tends not to be the most comfortable for either of us. 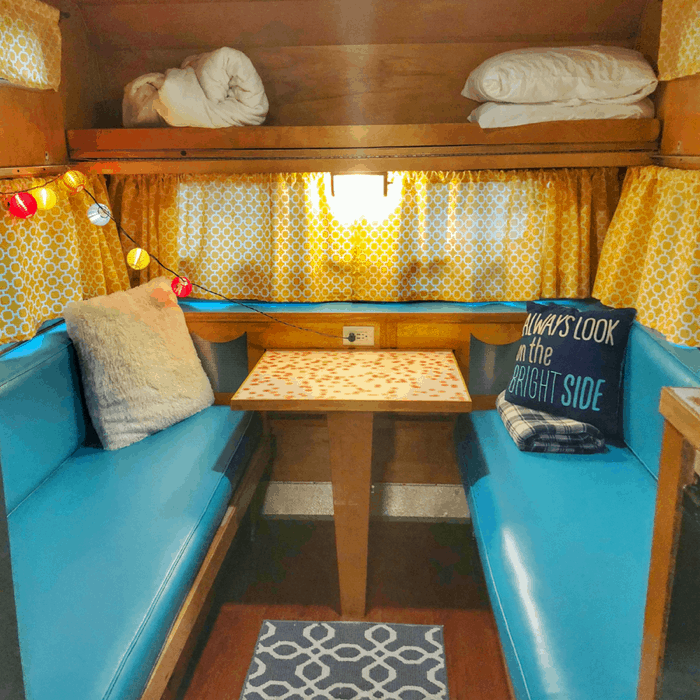 Lucky for us, the Winnebago dining area transformed into a KING SIZE bed just like what we have at home giving us each plenty of space to stretch out. 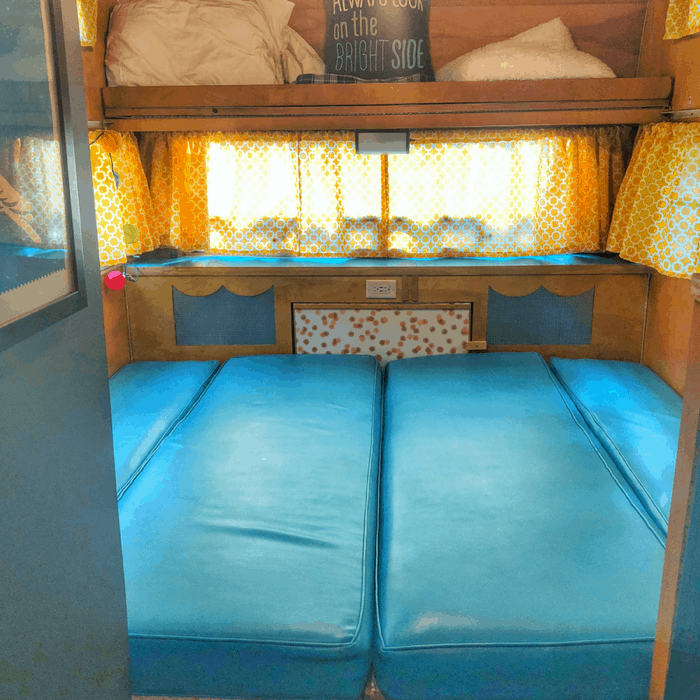 In addition to the King size bed, our retro camper had an additional bunk bed that could fold out above for additional sleepers. The camper sizes can typically accommodate 2 adults and 2-3 small kids. For an additional fee, you can rent a 6-8 person tent that can be set up on your campsite. 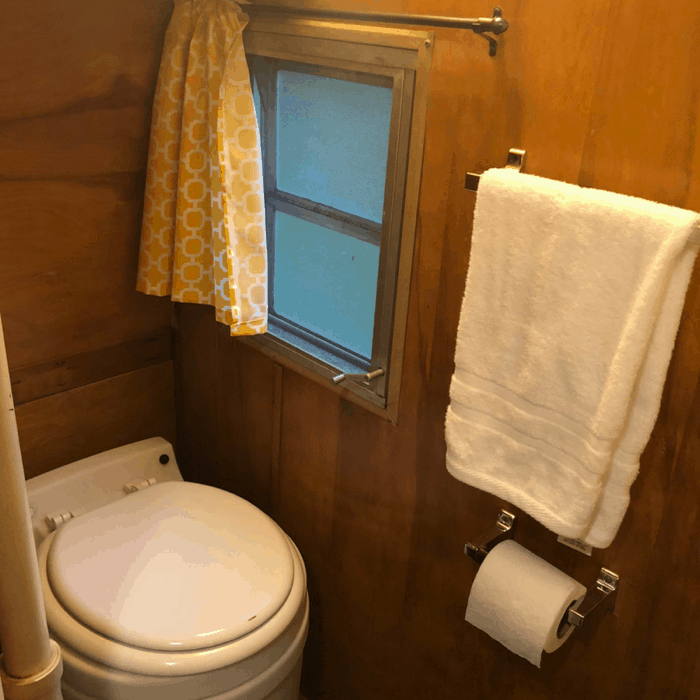 If you are not a big fan of using the restroom at the shower house you will be really impressed with the Laveo dry-flush toilet inside the 1964 Winnebago that works like a diaper genie for your waste so that overnight guests don’t have to worry about dealing with the sanitation by pumping out the waste after their stay. 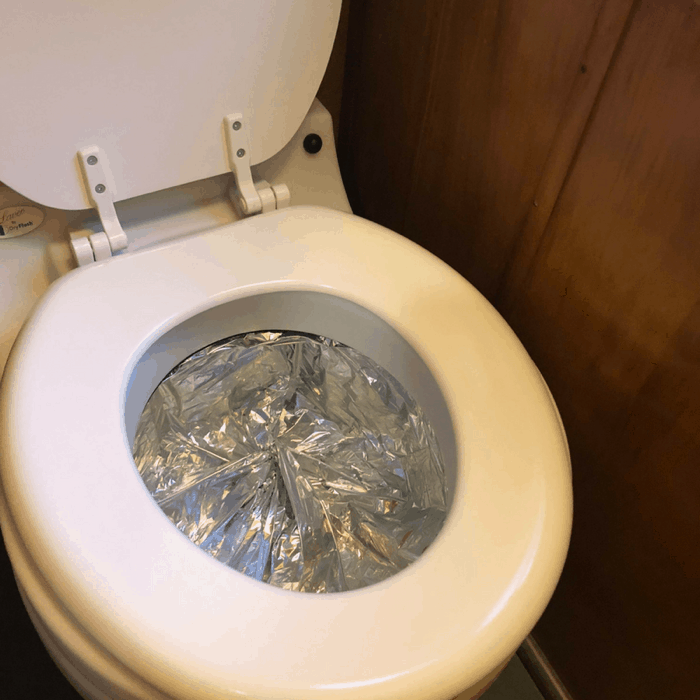 This dry flush toilet is seriously a game changer! Our first night in the Winnebago it rained a lot, and it was so nice to not have to make a dash for the shower house in the middle of the night when we needed to go to the bathroom. Each camper runs on 30 amp electric (standard at most campgrounds), and they provide converters for power via a home outlet. Besides the tents and porta-potties, they also rent grills, outdoor couches, table and chairs, and canopies if you need additional amenities during your overnight. I had a co-worker ask me about this one so I had to double check. Dogs are allowed but they do ask that they are potty trained and that the shedding is kept to a minimum. 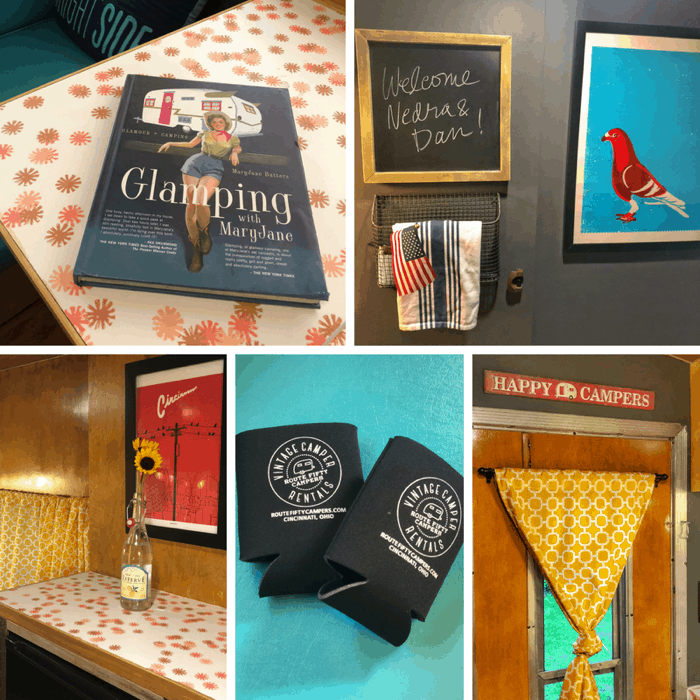 I absolutely LOVED our glamping experience! 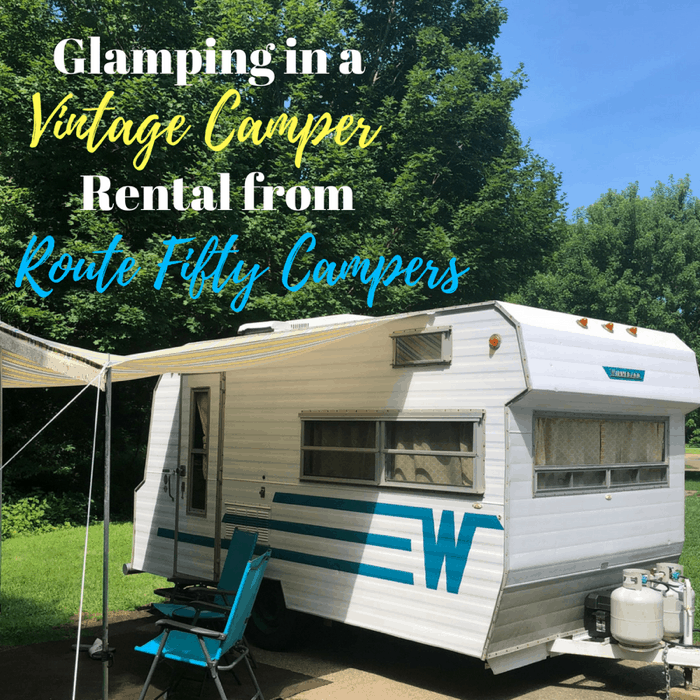 You can book your retro rental from the Route Fifty Vintage Camper Rental website. 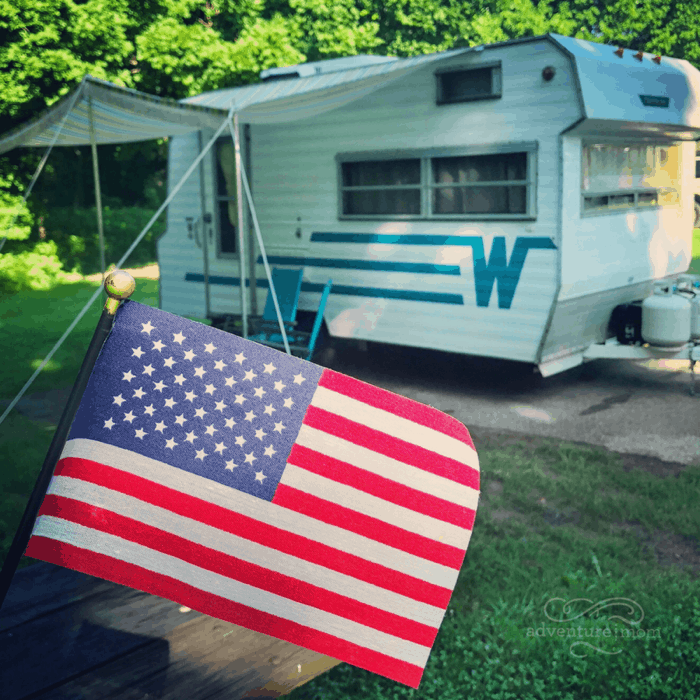 There are currently 4 retro campers for rent (1985 Scamp, 1969 Aristocrat Lo-Liner, 1964 Winnebago, 1958 FAN) There are also “Experience Packages” available at two specific locations if you want to include an adventure during your stay. 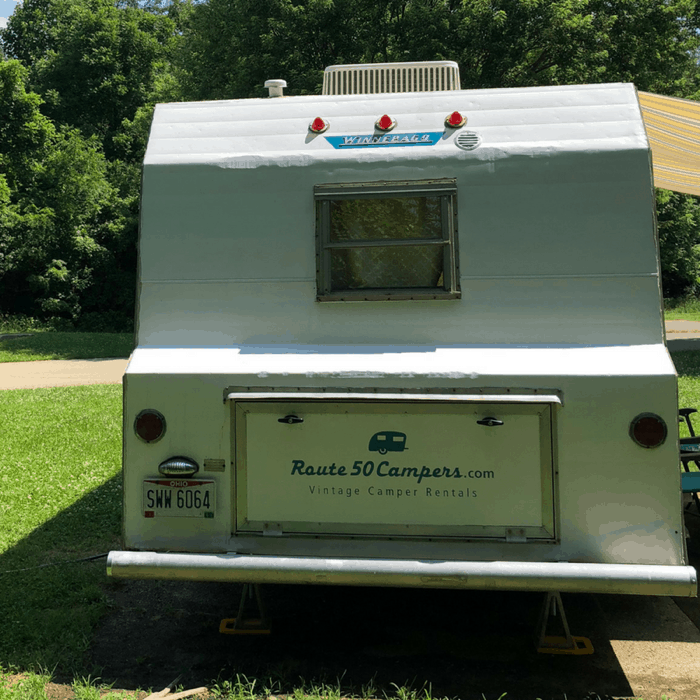 Thanks again for Route Fifty Campers for hosting our visit. All opinions are my own. Enjoyed our visit for the day! Brought back a lot of memories we had RV camping beginning in 1973 thru 2012. A great way to try out RVing before investing in Trailer and Tow vehicle. The setup looks really good and the camping must have been a really great experience! !